60 days long Yatra 2018 would commence on 28th June 2018, on the auspicious day of Jyestha Purnima, as per Hindu Calendar, and, as per continuing tradition, conclude on Shravan Purnima (Raksha Bandhan) on 26th August, 2018. The Yatra trek through the mountains of south Kashmir Himalayas to the Holy Cave Shrine of Shri Amarnathji is made available only in the months of summer to pay obeisance. 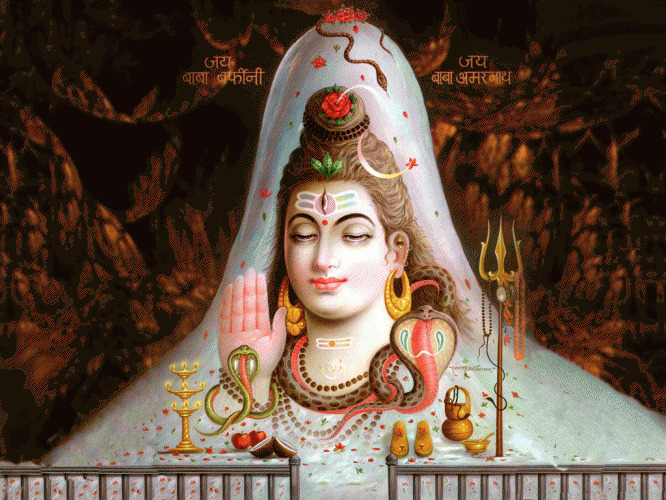 In the month of Shravan (July - August) the Holy Cave Shrine of Shri Amarnathji has the devout flock, where the image of Lord Shiva, in the form of a Lingam, is formed naturally of ice - stalagmite, and which waxes and wanes with the moon. Shri Amarnath Yatra is for a specific period/ duration, commencing on an announced date, usually on, the auspicious day of Skandshasthi as per Hindu Calendar, and shall conclude on Shravan Purnima (Raksha Bandan) You need confirm your helicopter tickets before schedule. You can book your yatra package with confirmed helicopter tickets now. Advance booking starts on 27th April 2018. The per passenger one way heli- fare for Yatra 2018 has been fixed at Rs. 1,600/- (inclusive of all taxes) for the Neelgrath-Panjtarni-Neelgrath and Rs. 2,751/- (inclusive of all taxes) for the Pahalgam-Panjtarni-Pahalgam sectors. Our services start with your arrival at Srinagar Airport. Meet and greet by our airport representative. Transfer to Sonmarg. On arrival check-in at Hotel. Rest of the day free to relax or visit Thajewas Glacier. Overnight stay in Sonmarg. Early morning transfer to from Sonmarg to Baltal. Departure for the Holy Cave by Helicopter from Baltal Helipad. The Helicopter start operating at 06.00 Hrs (Weather Peremiting). You will get appox. 1 hour for Darshan. Pass for priority Darshan is provided. On return you will be met by our driver. Transfer by vehicle from Baltal to Srinagar. On arrival check-in at Houseboat. Dinner and Overnight stay at Srinagar. After breakfast visit the Mughal Gardens, Chashmi-e Shahi, Nishat & Shalimar Bagh. In the afternoon enjoy a 01 Hour Shikara ride on the Dal Lake. Overnight in the hotel. After breakfast time free till departure. Transfer to Srinagar Airport for your flight to next destination. 01 Vehicle for all the services as per above program. Same Day Return journey by Helicopter to the Holy Cave from Baltal. 1 Night stay at Hotel Glacier Heights in Sonmarg with breakfast & dinner. 1 Night stay at Deluxe Houseboat in Srinagar with breakfast & dinner. 1 Night stay at Hotel Shefaf in Srinagar with breakfast & dinner. Amarnath yatra is a religious adventure. It gives you a flavour of hiking, camping, trekking, breathlessness and God. Amarnath Cave is a speechless, powerful demonstration of beauty of nature. Beautiful caricatures formed from ice is a worth a beauty after the treacherous trek to the cave. The track places you in midst of death and life many a times. This is such a life changing experience. The unknown will be serving and helping you in best possible ways like your own family members at the time of distress. There are lot of bhandaras and langars set up throughout the way up to the cave. They will provide you with what best they can provide in terms of food, shelter, medicines. These bhandaras have a positive cutthroat competition. Each bhandara wants to serve yatris or travellers of what other bhandaras have missed and or are not able to serve. They are the best example positive competition, a pure demonstration of win-win strategy. You will find anything you can think of to eat up there in the hills. Popcorn, Cold drink, Cotton Candy, Manchurian, Chowmein, burger, fried rice and the list is endless. However, all food served is strictly vegetarian. In short you, do not have to worry about food in the Amarnath yatra once you have reached pahalgam or baltal. You can reach amaranth cave from baltal as well as pahalgam. The pahalgam route is difficult and it takes days to reach the cave. Belief is that pahalgam is the actual route, which Lord Shankar took to reach the cave. The baltal route is short. Back and forth is easily managed in a day, when all is by your side. When I say all by your side, the major factors are weather, your health, time you start your journey from the base camp. One should start the journey latest by four in the morning, and if you have a decent stamina, will be able to manage back to the base camp by four in the evening. You can choose to travel by Helicopter, Palki, Pony or your strong legs.